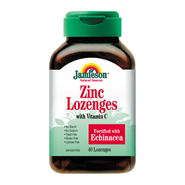 Jamieson Zinc Lozenges combine elemental Zinc, Vitamin C to help boost the immune system's virus fighting power. Free from artificial colours, flavours, and preservatives. Each lozenge contains: Medicinal Ingredients - Elemental Zinc (from Zinc Citrate) 5mg, Vitamin C (Ascorbic Acid) 50mg. Sweetened with Sorbitol and Fructose.